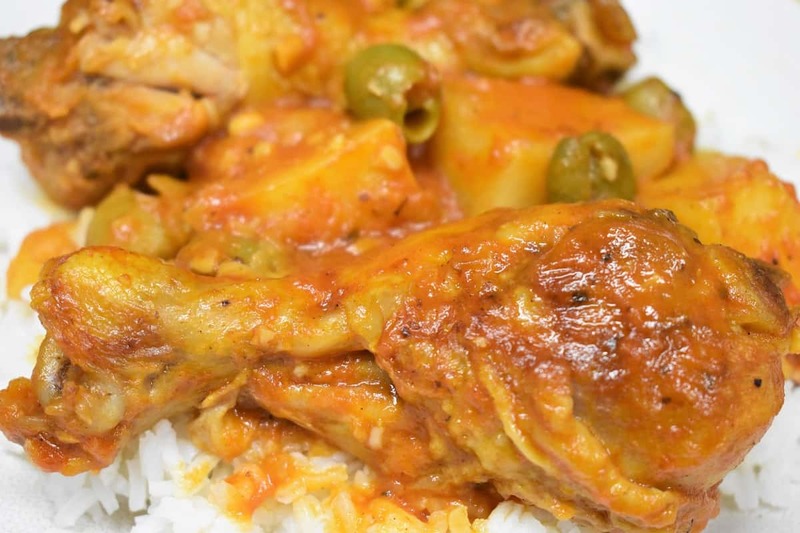 Chicken Fricassee is the ultimate in Cuban comfort food. 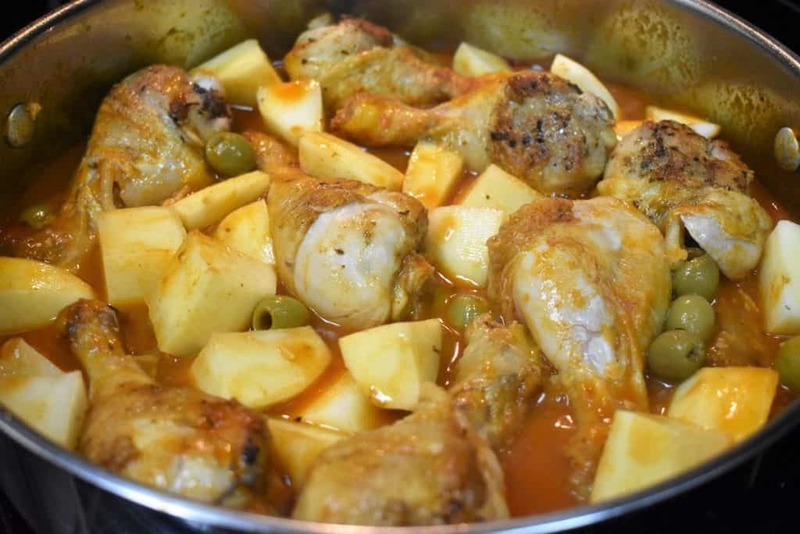 In Spanish this stewed chicken is called Fricase de Pollo. 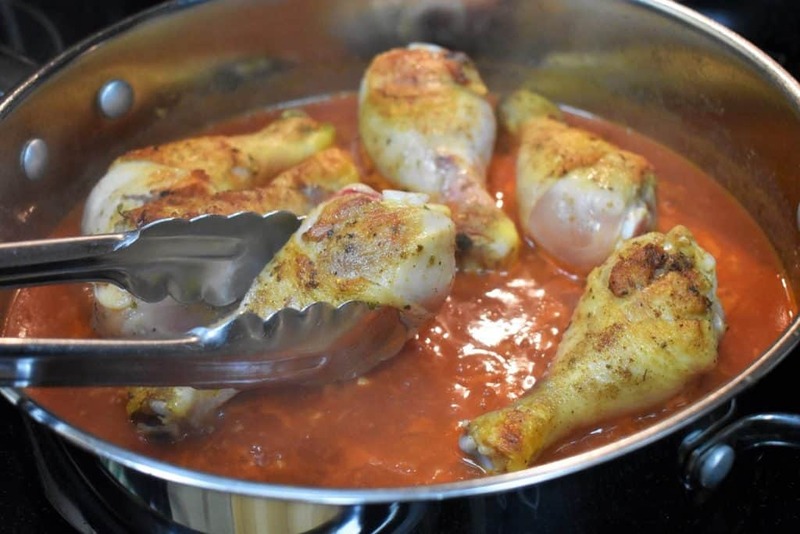 In this recipe, dark meat chicken is braised in a flavorful tomato sauce until it is fall-off-the-bone. Tender potatoes and salty olives finish this dish beautifully. Serve the chicken fricassee on generous bed of white rice for a filling, delicious meal. 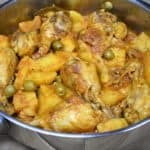 If you’d like to try more deliciously-different chicken recipes, try this white chicken fricassee. It’s made with a white sauce instead of red. Or, try this pollo en salsa, which is a simple chicken in tomato sauce flavored with chorizo. 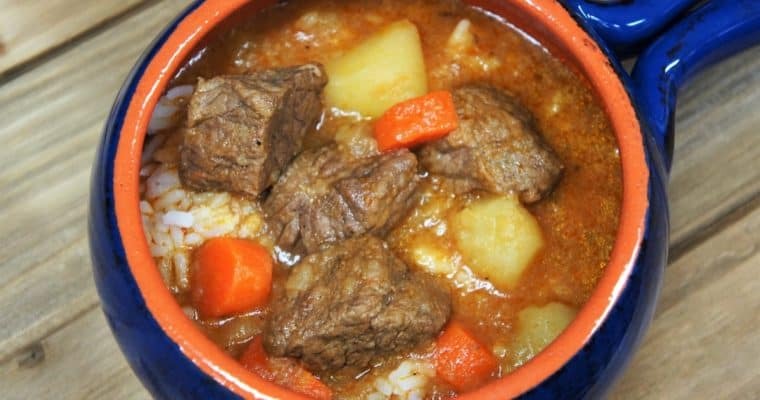 If you want to try a hearty beef dish, this carne con papas recipe and this sopa de res (cuban-style beef soup) won’t disappoint! The prep work on this dish isn’t too labor intensive. But, things do move pretty quick in the beginning. It’s best to have every prepped up and ready to go before you start. Add the salt, cumin, oregano and black pepper to a small bowl. Sprinkle the chicken on both sides with the seasoning mix. Dice the onions and mince the garlic. Keep them in separate bowls because they will be going in at different times. Measure out the water, white wine, tomato sauce and olives. If you want you can peel and chop the potatoes later. There will be a 15 minute window before they go in. I prefer to get them ready to go with the other prep work. That way I can clear away the cutting board, get it washed up and I’m done with that! Keep the peeled and chopped potatoes in a bowl of cold water. This will keep them from browning. Just remember to drain the water before adding them to the pan. Heat the olive oil in a large, deep skillet or a large pot over medium heat. Use a pan that has a tight fitting lid. Add the chicken to the skillet and cook for 5 minutes, turn the chicken and cook another 5 minutes. Remove the skillet from the heat so that the oil and bits on the bottom don’t start to smoke. Remove the chicken from the skillet onto a plate and keep warm. Cover the chicken loosely with a piece of aluminum foil. Or put the plate in the microwave. That’s what I do, the chicken stays warm away from drafts. At this point, the chicken will not be cooked through. Don’t worry, it will finish cooking in the sauce. Place the skillet back over medium heat. The oil should still be hot, but if it’s not give it a minute or so over the heat. Add the onions to the skillet. Cook them for 2 minutes, stirring frequently. Next, add the garlic and cook for about 1 minute while stirring constantly. Carefully add the wine, to the skillet. Stir, while gently scrapping all the bits off the bottom of the skillet. Let the white wine cook out a bit. This should take about 3 minutes. You’ll know it’s done when there is barely any liquid left. Add the tomato sauce, water and the bay leaf to the skillet and stir. I like to add a little bit of the water to the empty can of tomato sauce to get every drop out. Now, add the chicken back to the skillet. Include any juices that collected on the plate. When the sauce comes back to a simmer, lower the heat to medium-low and cover the skillet. Cook the chicken fricassee for 15 minutes. Keep the sauce at a simmer. If the liquid is boiling too vigorously lower the heat a bit. This is very important, because we need that sauce to cook the potatoes and for the final dish. Give the skillet a quick shake every once in a while, to make sure the chicken isn’t sticking to bottom. Stir the sauce about halfway through the cooking time. Uncover the skillet, give the chicken and sauce a quick stir. 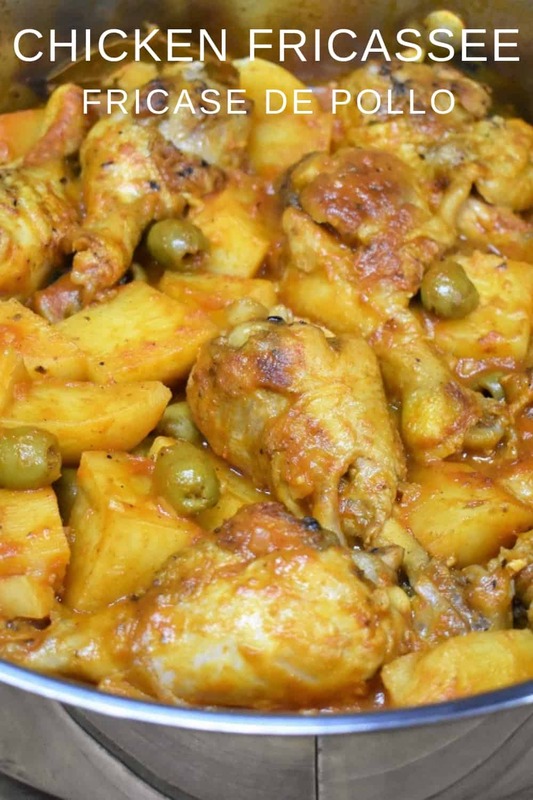 Add the potatoes and the olives to the chicken. Oh, and if some of that olive brine happens to make its way into pan, it’s kind of a good thing! Give everything a good stir to combine. Arrange the ingredients so they’re not mounded and everything has its own space. Cover the chicken fricassee and cook for another 15-20 minutes. Keep it over medium-low heat. Make sure the sauce is simmering, but not boiling. Lower the heat if you need to. Give the skillet a quick shake every once in a while. The potatoes should be fork tender and the chicken at least 165°F. Take the internal temperature of a couple of the larger pieces to be safe. You should take the temperature at the thickest piece of the meat, making sure not to touch the bone. We use an instant read thermometer, it’s automatic for us. When we think it’s done we take the internal temperature of the meat, casserole, whatever. It’s a really good habit to get into, and it’s easy to do. Now, I don’t like to stir the chicken fricassee at this point. The potatoes are tender and will break apart. Just give the pan a few shakes (with the lid on) everything will move around and the sauce will coat the chicken and potatoes. Season the chicken with the salt, cumin, oregano and black pepper. Heat the olive oil in a large, deep skillet or a large pot over medium heat. Add chicken. 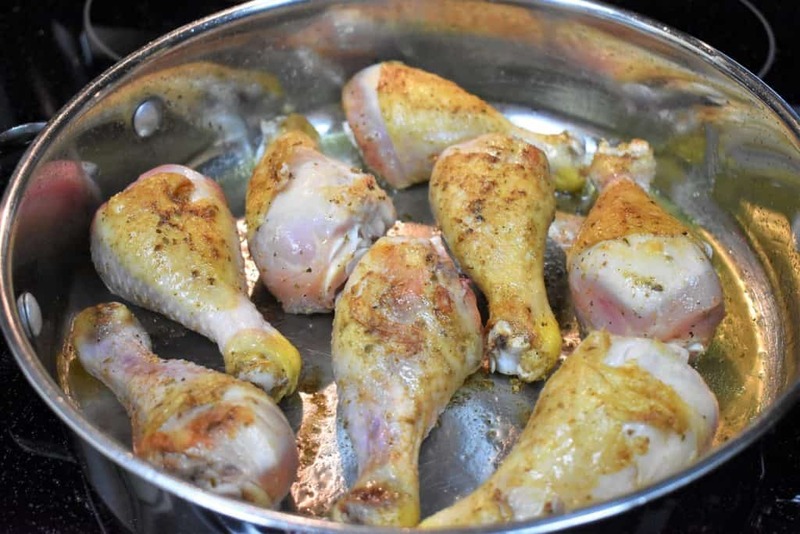 Cook the chicken for 10 minutes – about 5 minutes per side. Remove the chicken from the skillet onto a plate and keep warm by tenting with foil or keep in the microwave or oven. The chicken will stay warm away from drafts. Add the onions to the skillet and cook for 2 minutes, stirring frequently. Add the garlic and cook for about 1 minute, stirring constantly. Add the wine, to the skillet and stir while gently scrapping the bits off the bottom of the skillet. Cook until the liquid has evaporated – about 2-3 minutes, stirring frequently. Add the tomato sauce, water and the bay leaf to the skillet and stir. Add the chicken back to the skillet (including any juices collected on the plate). 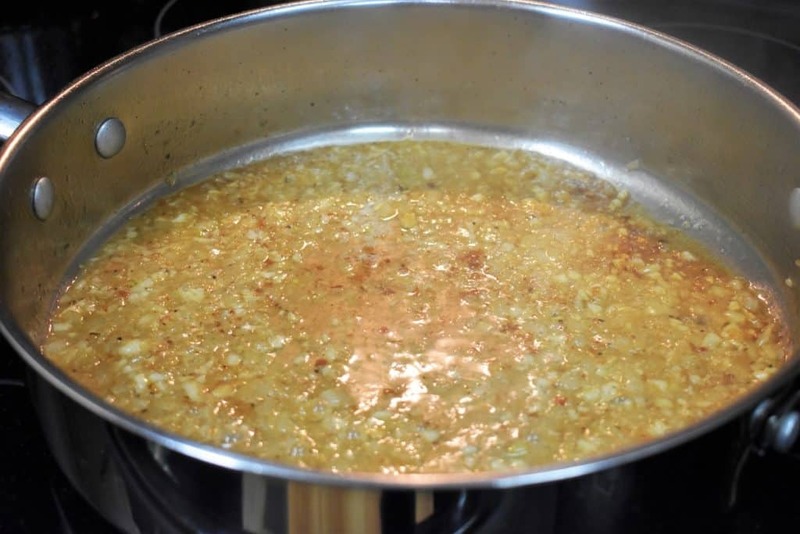 When the sauce comes back to a simmer, lower the heat to medium-low and cover. Cook the chicken fricassee at a simmer for 15 minutes. Lower the heat a bit if the liquid is boiling too vigorously. 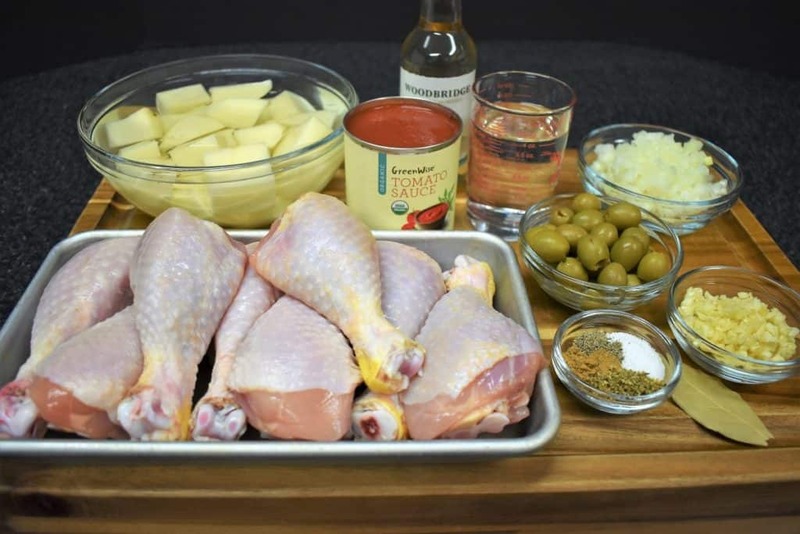 Uncover the skillet, give the chicken and sauce a quick stir, then add the potatoes and olives. 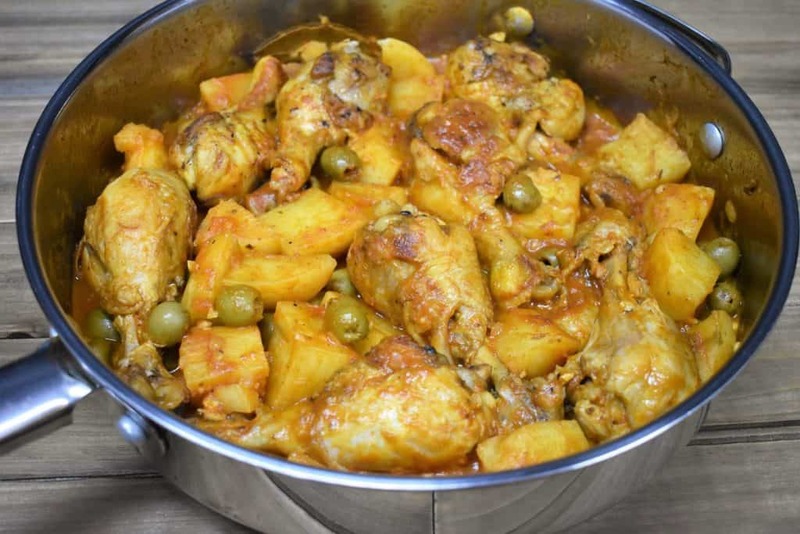 Cover the chicken fricassee and cook, on medium-low heat, another 15-20 minutes until the potatoes are fork tender and the internal temperature of the chicken is at least 165°F. Give the skillet a quick shake occasionally.